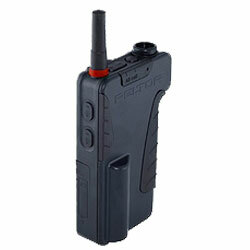 TRBOnet - Dispatcher applications for Motorola MOTOTRBO. Main advantages of TRBOnet are its scalability and reliability. At having created not very big radio communication network you can increase it without any limits both in quantity of users and territory of use. In the system there is no ‛central mind‛, and in case of failure of one TRBOnet component the whole system will continue to function. Complex implementation of TRBOnet and MOTOTRBO™ increases considerably an efficiency of production and business processes due to allocation of new radio communication services and permits to decrease expenses for radio networks organization. 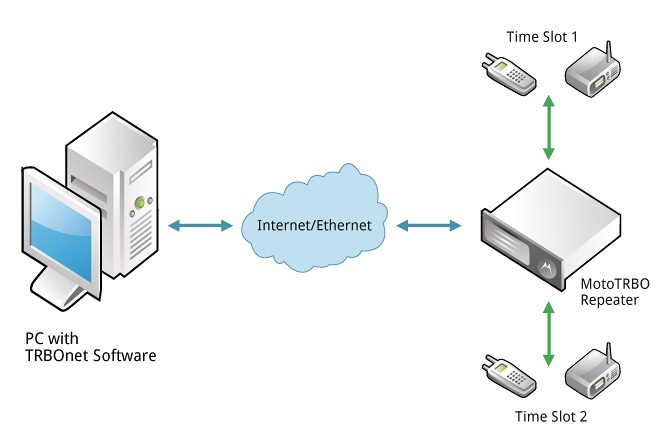 The main component of the system is 'radioserver' that is program software installed in a computer which is digital fixed radio station Motorola MOTOTRBO™ connected to, for ensuring connection with mobile users through a radio channel. At turning on the power user radio station MOTOTRBO™ sends an authorization enquiry to the radioserver and registers in the network. For registered users in the TRBOnet network for a dispatcher main features of the system become available; those are individual and group calls, sending of text messages, use of built-in telemetry of MOTOTRBO™, GPS-monitoring of users, conversation recording etc. In the data base of the radioserver there is information about all registered user radio stations. The highest number of users working with this radioserver is limited with the radio channel capacity only. There can be unlimited number of radioservers, they can be situated in any point of the world, Internet access is needed only. 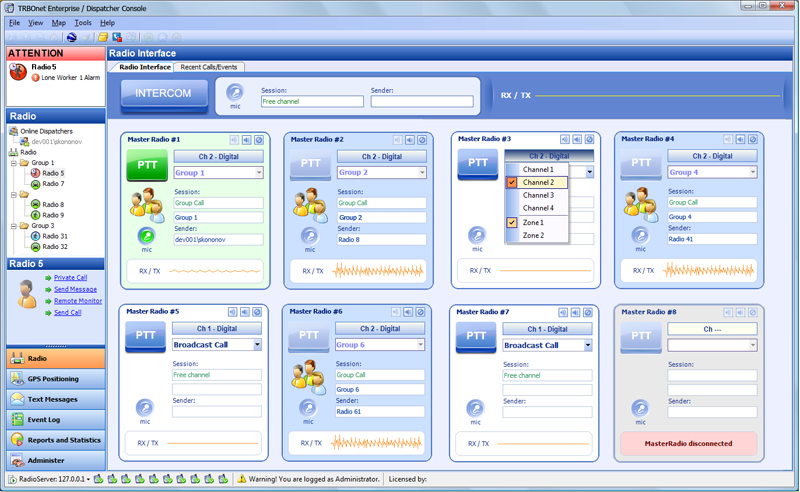 Unlimited number of dispatchers can connect to any radioserver through computer networks. 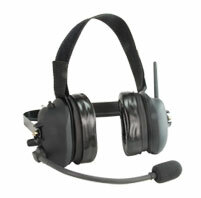 A dispatcher gets a possibility to call any available user of the TRBOnet network from the dispatcher’s work place. TRBOnet uses GPS-receiver and digital maps of different types built-in radio stations MOTOTRBO™ to monitor fleet of movable objects and their management. 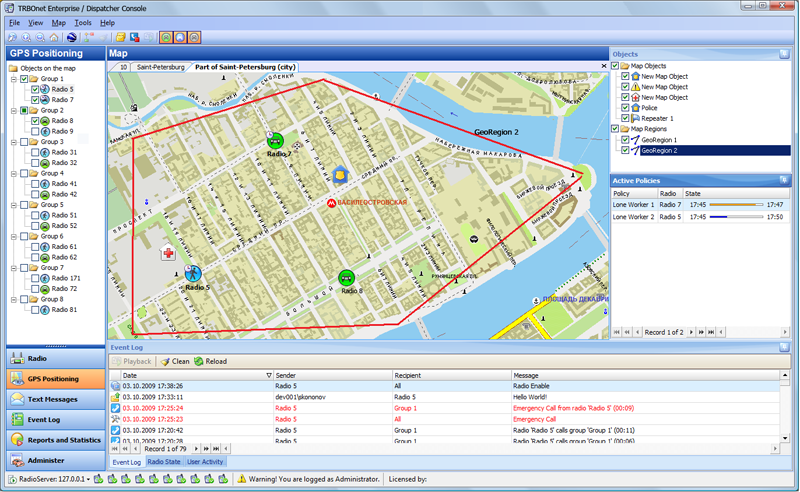 At the same time a dispatcher can get on-line information about current location of a police car, an ambulance car or a car transporting covetable items or dangerous items in an on-line mode at a digital map, and in case of need communicate with the car through radio communication or transfer to the user different data in digital format. TRBOnet Enterprise supports radio networks where operate both analog (including MDC) and digital subscribers. At that, calling subscribers’ ID (callsing) is always visible to Dispatchers.